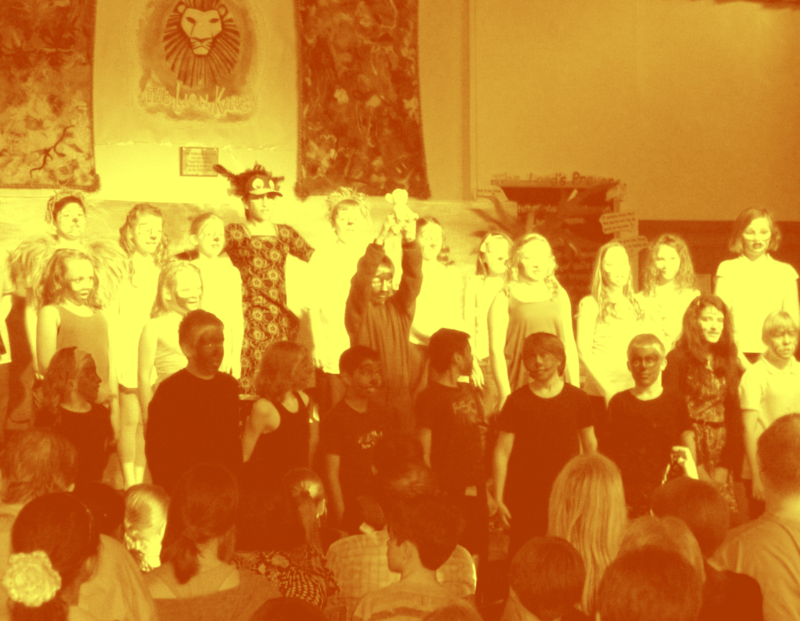 A Quirky Kook: The Lion King, A Year Six Production. There is just one production per year at The Third Girl's school and it is, traditionally, the leaver's performance put on by that year's soon-to-be-departing Year Six. This year, The Third Girl is in Year Six and the production was The Lion King. B. None of the parents dare swear in the playground. Class Six (see A above). The Boy asks for the sweets. The bag of sweets you've cunningly prepared earlier fully aware that he's six years old, seeing this performance for the second time (school matinee yesterday), it's after his bedtime and he would really rather have an apple. It's strategic parenting of sorts but there is absolutely no way you can tell this to the headmistress who would be looking down her nose if it wasn't already pointing, pointedly you think, at the stage. You shush The Boy. You give him the sweets. You smile at the headmistress. The headmistress is still looking at the stage. The Boy wants his drink. It's Ribena. It's in a carton. It has a straw. There is NOTHING that the headmistress can look down her nose at in that, is there. IS THERE? The Third Girl joins us in the playground. She drinks her Ribena and doesn't squirt it over herself, the final proof, if proof were needed, that she's growing up *Emotional sigh. * The wine queue stretches from the library to the hall so the interval continues until everyone's served. We return to our seats, glasses in hand. There's a collective deep breath and then.. The second half romps to a satisfactorily teary conclusion. "The Circle of Life" circles around once more signifying the end. The class, collectively and in relief at a job well done, give it (a technical term) Some Welly. The audience collectively dips it head and reaches for a tissue. The applause is wild, unrestrained, but mostly relieved. It's even more relieved 20 minutes later when we've had an encore of "The Circle of Life," the bouquets have been handed out, there's been a speech and yet ANOTHER reprise of "The Circle of Life." It's way past The Boy's bedtime but all he wants to do is go home and watch The Lion King DVD and dream of the day when he reaches Class 6. TeenTwin1 and TeenTwin2 are hatching a plot to adopt Timon and Pumbaa *rolls eyes* and The Third Girl? The Third Girl is suddenly unrecognisable as insouciance personified skipping along with the little silver trophy she was awarded for being the production's best dancer. I check the camera to make sure I got all the good bits (the bits with The Third Girl in). I watch them later when everyone else is in bed. Aww this sounds amazing! i dont know about you but at these moments it really brings it home that our babies are not babies for long! your daughters school is very posh .. wine?? we have to make do with dilute juice in paper cups!